It's time to give you the list of the products from makeup to skincare to random ones that became my go-to, most-used and favorites. 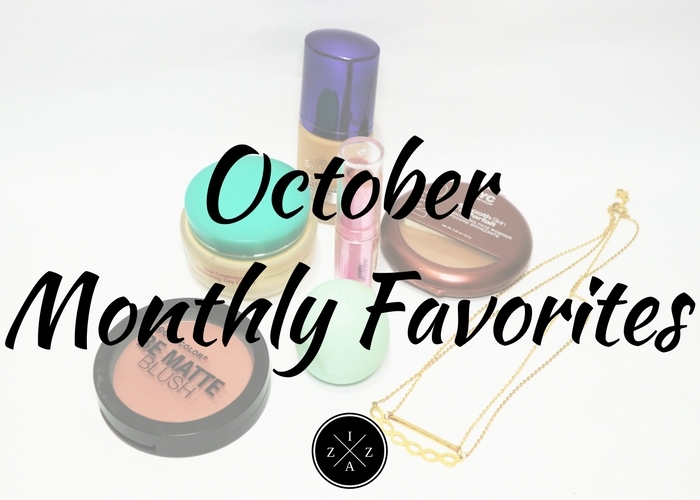 Welcome to my Monthly Favorites for October! I had this lip balm since last February 2016 and I never really toughed it or open it in its packaging. I bought it in a bazaar inside Pampanga Hot Air Balloon Site thinking I'll review it for you but I totally forgot about this baby. This EOS Lip Balm in Sweet Mint is addicting on the lips. It is packaged in blue green pastel color which I absolutely adore. I love the minty taste it gives when applied plus it moisturizes very quick. Upon application you'll definitely feel the balm working on your lips. This is my current go to lip moisturizer. Of course I have to include my City Color Be Matte Blush in Sunset Safari as my favorite for October. I am very thankful to purchase this blush and it's giving me so much happiness in every swipe. I have a full review on this product you can read HERE. I love using this whenever I have an event to attend and it gives me long lasting bloom on the cheek area. This is easy to blend and the pigmentation is on point!!! With the price of 225pesos you'll definitely buy more of this blush. As I've mentioned in my review I am eying for Toasted Coconut and Hibiscus next. Aside from a legit matte blush I am also in the hunt for a good bronzer to contour. This NYC Smooth Skin Bronzing Face Powder in Sunny has been a talk of the town since I started watching YouTube videos and I'm glad I found it inside Pop Culture Trinoma. This product is the bomb and it gives really nice color on my temples and hollows of my cheeks. This and the City Color Be Matte Blush in Sunset Safari is the best combination ever. I also use this to contour my lids and my nose area and it works well too. Will create a separate full review about this soon. I know I mention that I'll be reviewing this new skincare item but for obvious reason I've been a procrastinating lately. If you follow me on Instagram you know I featured Himalaya Herbals on my wall a lot. I'm obsessed with this Himalaya Herbals Clear Complexion Whitening Day Cream and I can't move on my morning skincare routine without putting this. The packaging is super fancy, the scent is lovely for me and its not greasy at all. I don't want to spoil the things I'll be putting on my review soon so I will leave this teaser post just like that. If you haven't tried any Himalaya Herbals product then I encourage you to do so. READ: My Complete Current Day and Night Skincare Routine. This has been the only foundation I have right now in my collection that gives me coverage and can be used for my event hosting makeup. I love this SanSan HD Foundation and I think I got the perfect shade for my complexion which is Olive. I've been using this since I got it last month and it was surprisingly good!!! I love how my bronzer and my blush sits with this foundation. I also use the Avon Ideal Oil Control Pressed Powder in Medium I featured in last month's favorites and they go well together. At first it looks cakey but I found that using moisturizer and primer really helps. I've been using another sachet of Quick FX No-Shine Matte Primer and it changed my makeup game lately. I have shared my obsession over chokers last September and this month I have a new love. Dainty Gold Accessories from necklace, bracelet and rings are my favorite to wear for October. The necklaces I bought for 150pesos only on Glorietta. The rings and thick bangles came as a set in Forever 21 for 300pesos and the charm bracelet is from a Korean Shop inside Farmers Market Cubao. These make my outfit look sleek and polished. What's your favorite/s for October?